For one reason or another, the characters with the least amount of screen time have become some of the most popular in the Star Wars universe (Boba Fett anyone? ), and the bounty hunters are definitely at the top of that list. 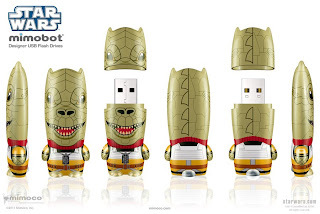 The latest designer flash drive from Mimobot is none other that everyone's favorite reptilian gun-for-hire, Bossk. And being that all of the big toy news is centered around San Diego Comic Con, why should this be any different you say? Mimobot is allowing people who can't attend the con to put their name on a waiting list by emailing sdcc@mimoco.com for your chance to purchase this piece.